A gorgeous, chic French restaurant that lets you bring in your dog while you dine in style? 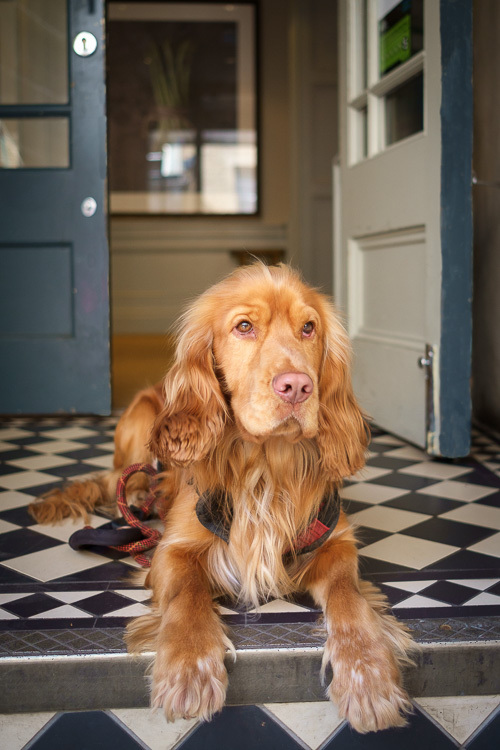 Barney (and we) were delighted to learn that the Brasserie Blanc chain’s Bath restaurant welcomed him with open arms. Luckily, he was on his best behaviour and, after a little sniff around his surroundings and a quick waggy welcome for our waitress, he slept like a baby under our table whilst we enjoyed a mouthwatering meal. 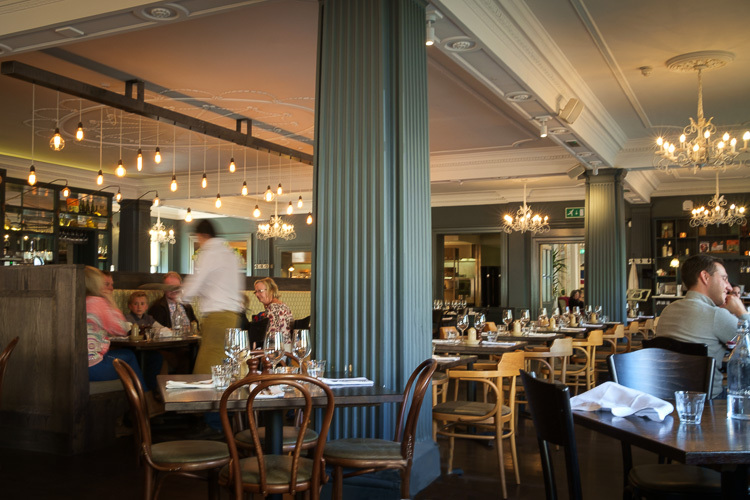 The interior of the restaurant – housed in a Georgian hotel – is relaxed but elegant with dark wooden floors, high ceilings and walls painted a matt heritage teal. There’s a clever mix of mood lighting – traditional filigree chandeliers, industrial bare bulb drops and wall mounted bistro lamps which adds cosiness and intimacy. I had the light and fluffy cheese souffle crusted with delicious cheesy bits and served with a silky warm melted Ford Farm cheese from Dorset. Mouthwatering. Alistair opted for the Potted Cromer Crab which he said was light and fresh-tasting with an added fruity creaminess from a layer of avocado at the bottom of the pot. My dish – King Scallops Provencale – was beautifully presented and tasted divine. 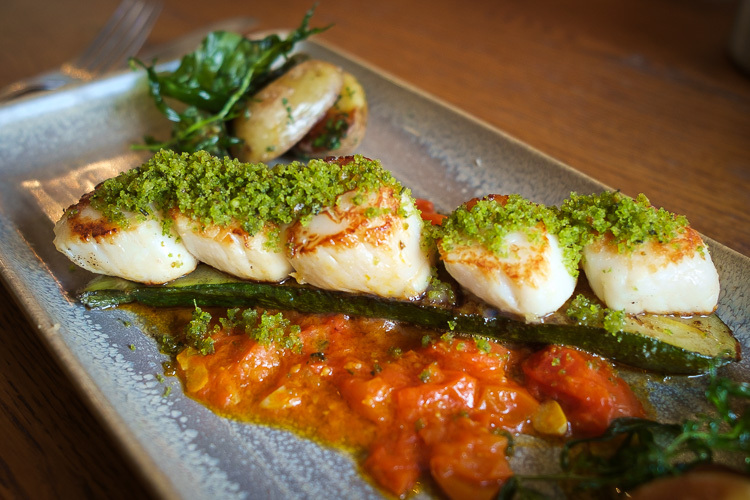 Suitably seared succulent scallops sat on a perfectly seasoned chargrilled courgette – a deep fried herb crumb adding some clever crispness to the softness of the scallops. The dish was served with a sweet cherry tomato and pepper sauce plus sauteed potatoes. I’m still dreaming of this plate some days later. 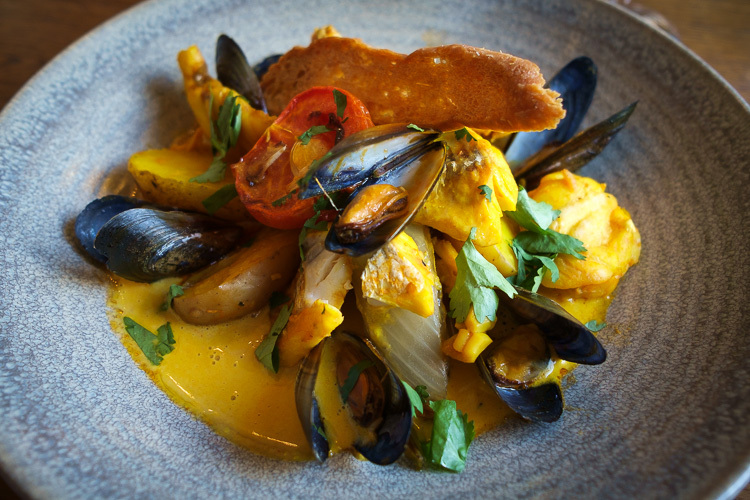 Alistair opted for a classic bouillabaisse which came with a fine selection of white fish and shellfish – monkfish, red mullet, sea bream, gurnard, squid and mussels. The creamy saffron soup was super tasty and a serving of tender fennel added some extra juiciness. 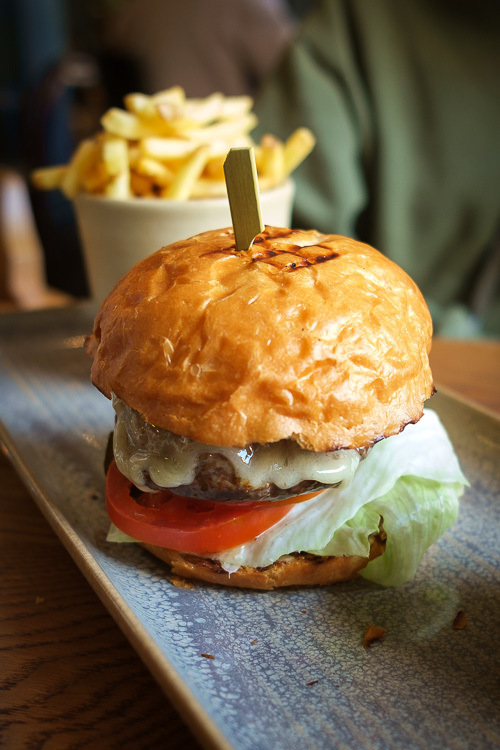 Our younger son played it safe and went for ‘Le Burger’ with added Comte cheese served in a soft brioche bun with fries. The burger was nicely cooked – still slightly pink in the middle – and no hint of chewiness and went down a treat. I chose a dessert from the set menu – a fresh and fruity cherry and apple compote with toasted almonds and creme anglaise and my son chose zingy lemon and mango sorbets. Both made a refreshing end to the meal. 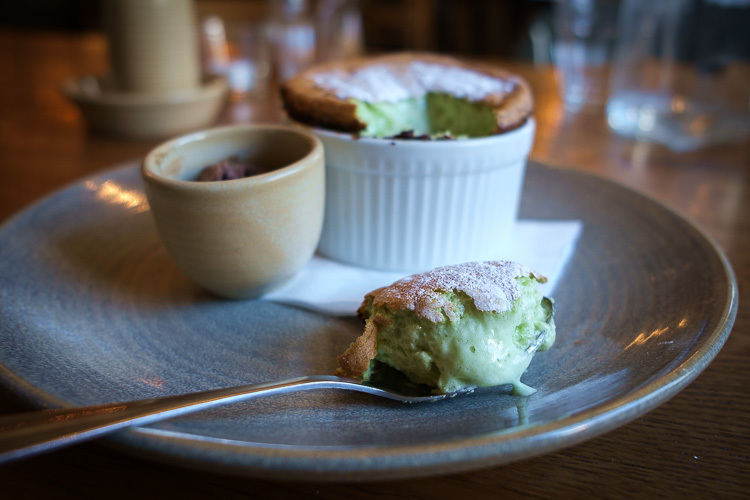 The show-stopping dessert was Alistair’s Pistachio Souffle – with it minty green soft melting middle, it was perfectly cooked, light and sweetly delicious. It came with a small pot of rich chocolate ice-cream which added extra depth of flavour. We chose a manager’s recommendation – Pulpo – a Spanish Albarino with notes of spicy apricot. 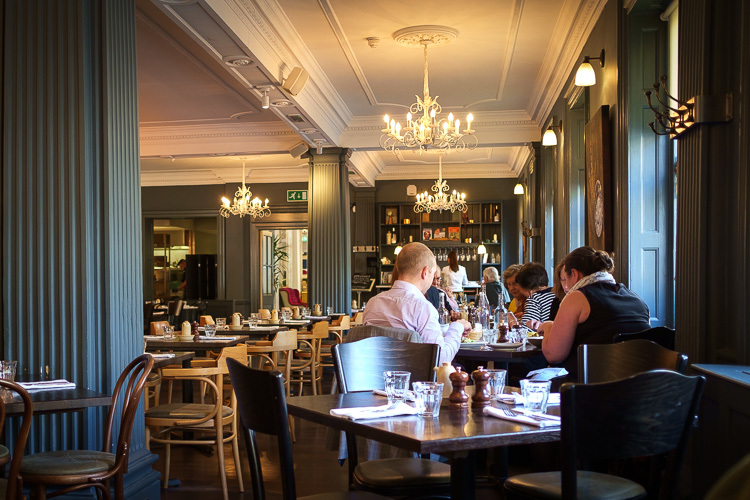 We’ll definitely return to Brasserie Blanc – as well as the A La Carte menu we chose from they do a really good value Set Menu (as you’d expect from a French restaurant).